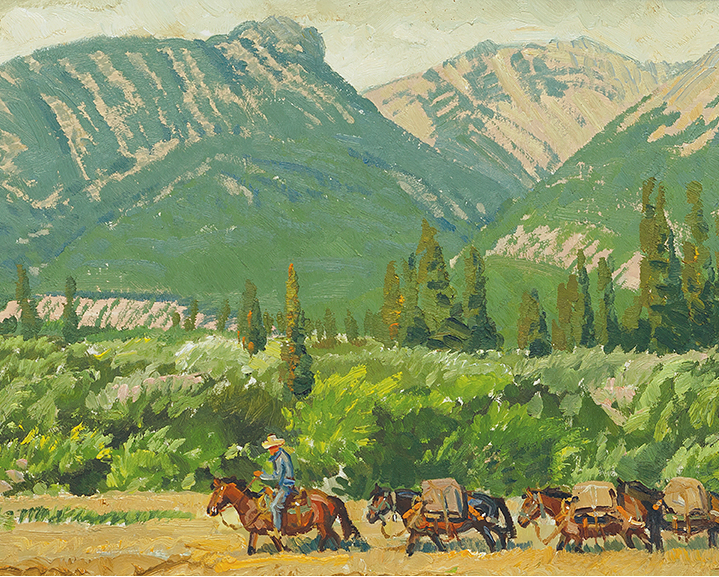 In order of appearance: Robert Lougheed (Canadian American, 1910–1982), Alberta Morning (detail), date unknown. Oil on Masonite, 10 × 20 inches. Tacoma Art Museum, Haub Family Collection, Gift of Erivan and Helga Haub, 2015.29.10. Mian Situ (Chinese American, born 1953), Beef, Beans and Biscuits, 2004. 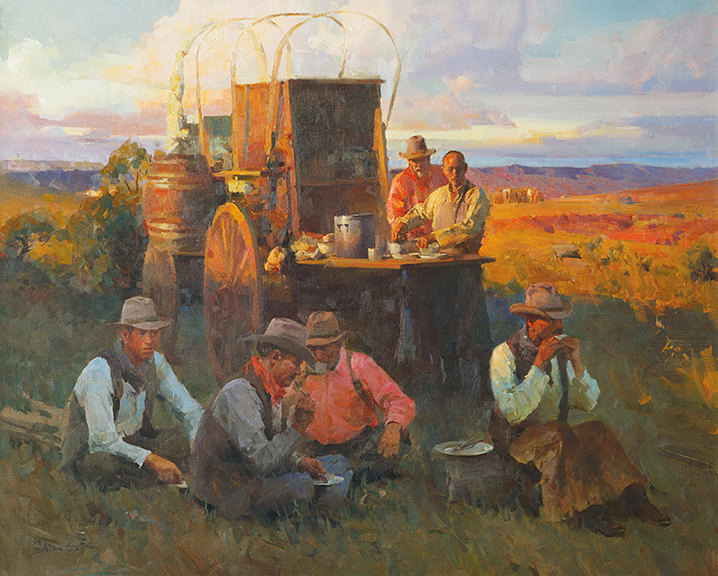 Oil on canvas, 41 × 48½ inches. Tacoma Art Museum, Haub Family Collection, Gift of Erivan and Helga Haub, 2015.29.16. 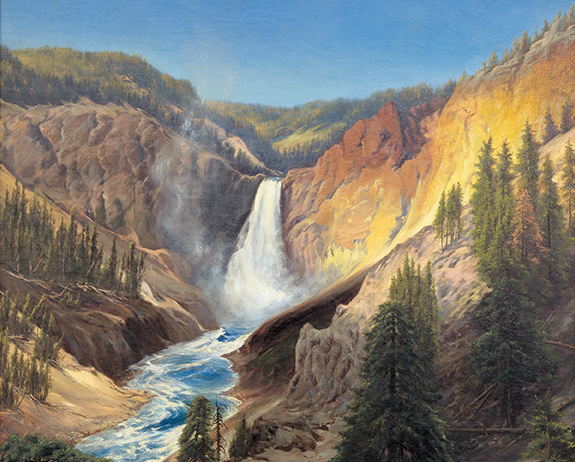 Frederick Billing (German American, 1835–1914); Peter Moran (English American, 1841–1914); and Thomas Moran (English American, 1837–1926), Falls of the Grand Canyon of the Yellowstone River (detail), circa 1894. Oil on canvas, 28 × 24 inches. Tacoma Art Museum, Haub Family Collection, Gift of Erivan and Helga Haub, 2017.14.6. 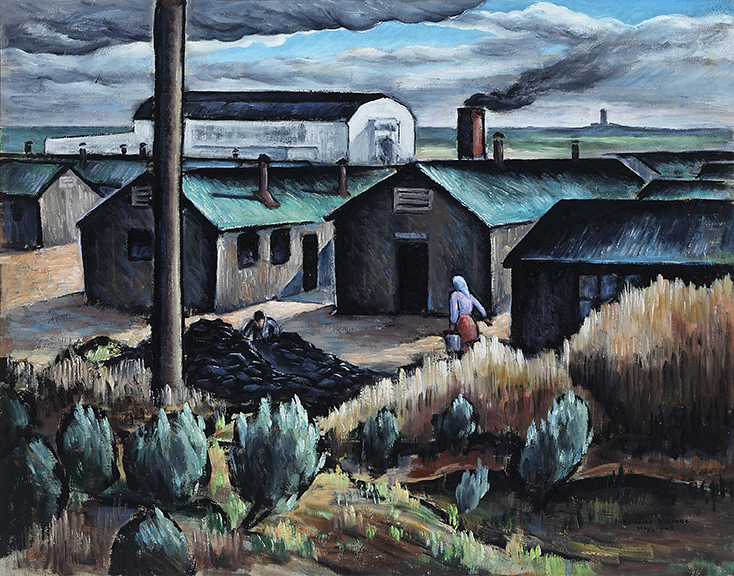 Kenjiro Nomura (Japanese American, 1896–1956), Gymnasium, 1945. Oil on canvas, 24 × 30 inches. Tacoma Art Museum, Museum purchase, 2013.6.